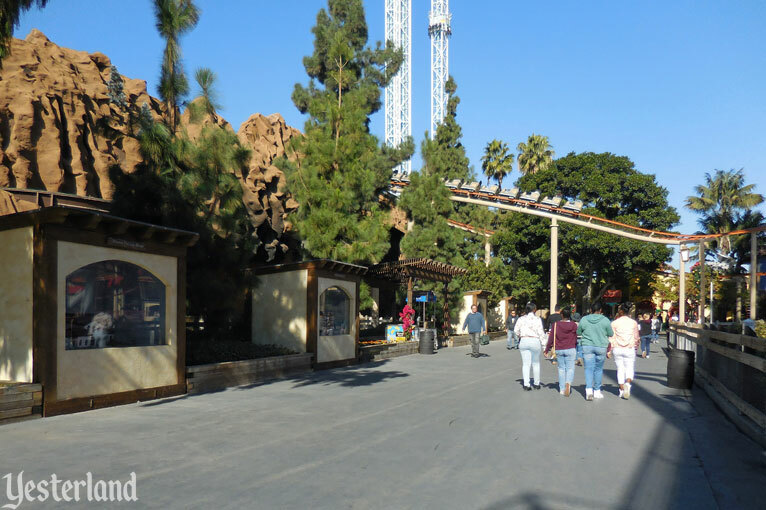 As the 20th Century came to a close, Knott’s Berry Farm was reinventing itself as a thrill ride park. Its original focus on California heritage took a backseat. 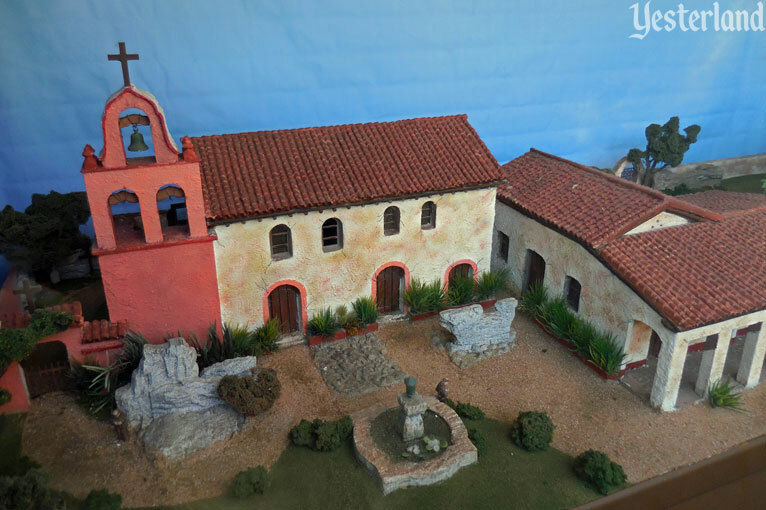 Slowly, over many years, the dioramas of the California Missions—which had been an iconic feature of the Farm for two generations—disappeared. It’s now the end of 2016, the year that Ghost Town celebrated its 75th anniversary. Over the past half dozen years, the management of Knott’s and its parent Cedar Fair have changed course. 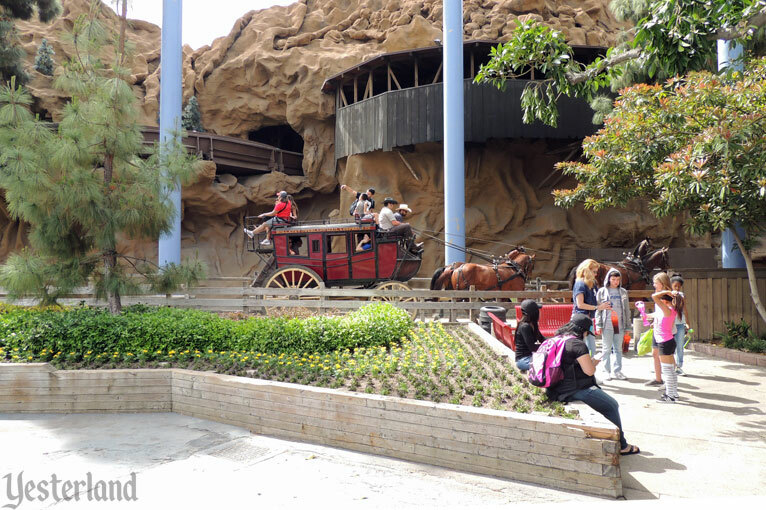 Knott’s turned its attention back to Ghost Town, the Calico Mine Train, the Timber Mountain Log Ride, Camp Snoopy, Mrs. Knott’s Chicken Dinner Restaurant, and fun for all ages—while continuing to offer a top-notch collection of thrills. 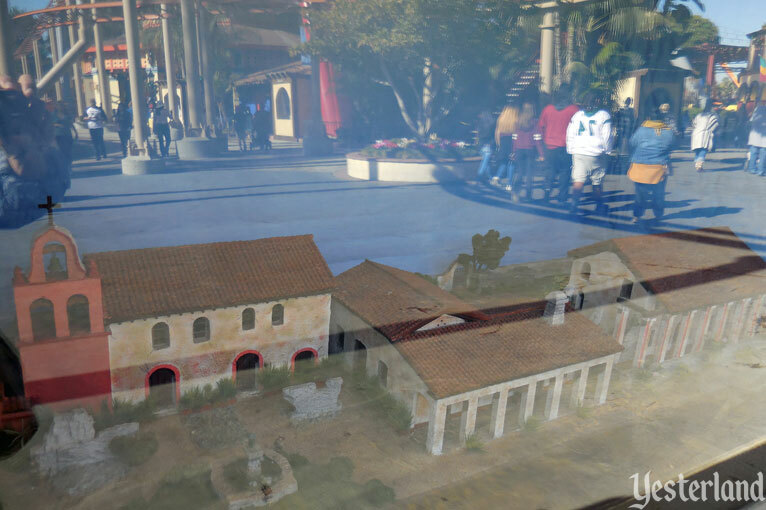 In late November 2016, the California Mission dioramas quietly returned to public view. 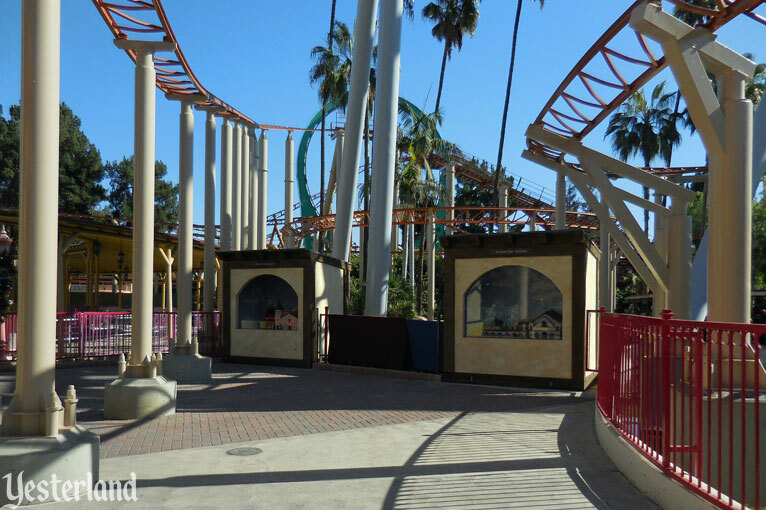 On December 2, Knott’s made it official with a press release. , Curator of Yesterland, December 16, 2016. In the 1950s, Walter Knott commissioned artist Leon Bayard de Volo to create models of the 21 historic California Missions that stretched from San Diego to Sonoma along El Camino Real—translated as the Royal Road or the Kings Highway. The miniature missions were works of art, not exact scale replicas. For Bayard de Volo, it was an encore to a similar set of missions he did for the 1939 Golden Gate International Exposition, which was the World’s Fair on Treasure Island in San Francisco Bay. Although the map above shows only four display cases with California Missions, there were actually 21. One was in the tunnel below the stagecoach overpass. The rest stretched from there to La Palma Avenue along a walkway—also dubbed El Camino Real—adjacent to the stagecoach route. A few missions disappeared in the 1980s; then, more in the 1990s. A few may have lasted into the early years of the 21st century. Eventually there were none remaining. The details of why the missions were removed may be lost to history, but it’s clear that they’d ceased to be a priority. Likely, it was easy and non-controversial to simply remove a mission any time one was damaged or whenever they needed another spot for a popcorn cart. After the Knott family brought in outsiders like CEO Terry Van Gorder to run the theme park, many elements that once brought charm, beauty, and interest to the “farm” gradually disappeared. By the early 2000s, it was clear that the area housing El Camino Real, the Church of Reflections, the large stands of trees, the “original” berry stand, the Little Chapel by the Lake, and the lake itself was considered “wasted space” and was destined to become home to another large off-the-shelf thrill ride. The future belonged to rides like Silver Bullet, which opened in 2004. It seemed the missions would never return. Surprise! In 2013, the missions began to reappear for the public—but only on a work table, not in display cases. Knott’s longtime wood carver Bob Weir was tasked with restoring 16 missions that had survived in storage and creating replacements from scratch for five that had disappeared entirely. Park guests could watch master craftsman Weir work on one mission at a time and talk with him about it. After Weir finished each one, it would disappear to the second floor of the Gold Trails Hotel building in Ghost Town, hidden from guests. The one question Weir couldn’t answer at the time was when and where they would be displayed. In 2015, Yesterland guest author M.H. Habata wrote Bringing Back the Missions at Knott’s Berry Farm. Please take another look. Knott’s Berry Farm announced today that the beloved scale models of California’s historic missions have returned to the park on Wednesday, November 30. 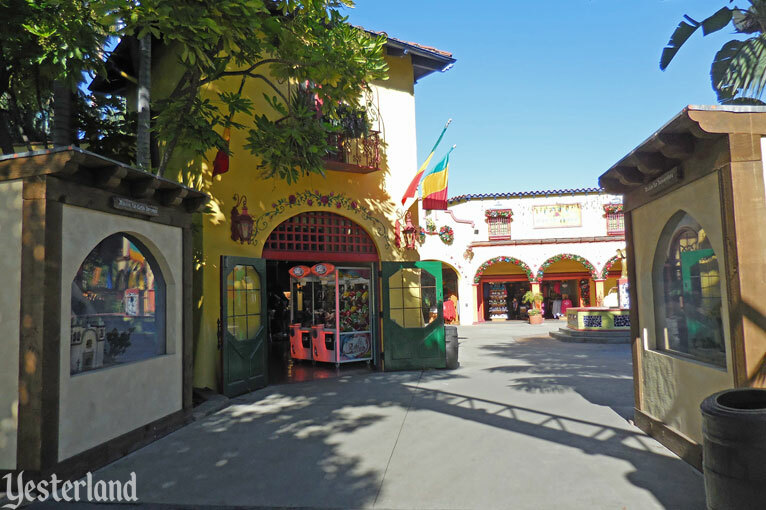 This project reflects Knott’s continued appreciation and preservation of California’s rich history. 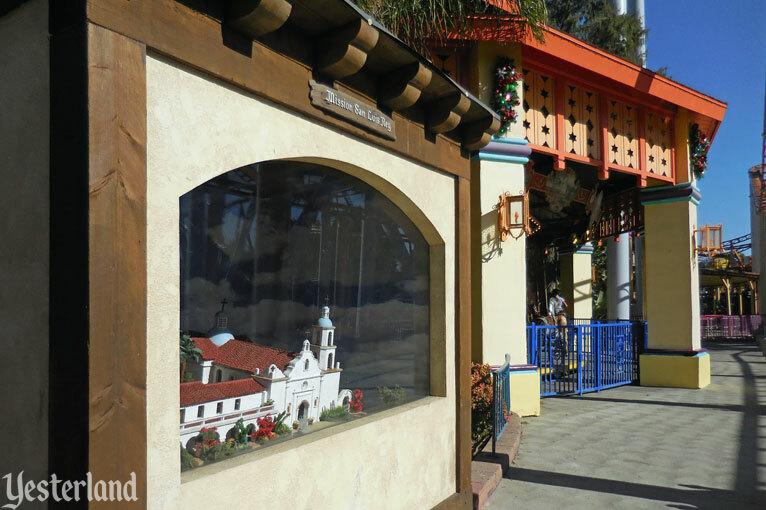 Scale models of the original California Missions border the same midway between Silver Bullet and the south entrance of Fiesta Village, as they did previously for many years. Twenty-year veteran of Knott’s Berry Farm’s woodshop and current Knott’s craftsman, Bob Weir, has been meticulously restoring the missions for over three years, for a new generation of guests to appreciate. In addition to the return of the historic missions, Knott’s is hosting its Early California History Day on March 15, 2017, in which students will have the opportunity to visit and tour the displayed models within the park, as well as have the opportunity to display a mission of their own. One homemade mission model will be selected to represent an individual school and enter into the California Missions competition. The winning models will be awarded special Knott’s Berry Farm prizes. Werner Weiss: Since March 2013, you watched Bob Weir restoring the original mission models and creating replacements for missing ones. Some of those 21 models are on display, but not all of them. M.H. Habata: I can confirm that there are 13 models on display, but not San Juan Capistrano (the largest model), or San Francisco de Asís (the last one Bob Weir worked on), or six others. We ran into Mr. Weir leaving his new public work area near the Indian Trails restroom, and he was pleased that the models were now on display. WW: I thought the missions would return sooner. WW: In your photos, the display cases look good, with their mission-style touches. When is sun is shining, are the models behind glass difficult to see? MHH: The glass made for a lot of difficulty in taking good photos because of the reflections, but not necessarily for a guest in being able to view the missions. My son and I used a jacket to try to shield the reflection of the roller coaster, lake, and passers-by, but it was necessary to get right up to the glass case. I don’t think the average visitor would have much difficulty in being able to see the models. WW: How do the dioramas look in their cases? MHH: The park used a light blue background simulating the sky around the inside of the case, and there is a fluorescent light bulb at the top of each case to provide lighting at nighttime. 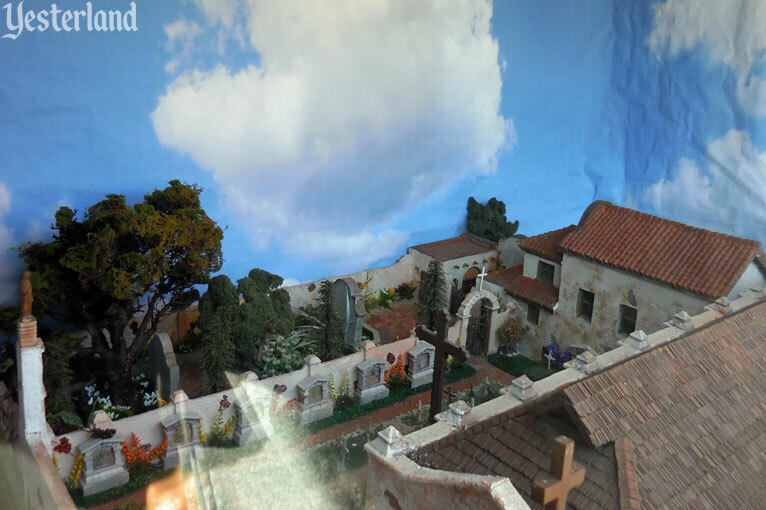 Also, most of the models are tilted at an angle, with the back higher up than the front to allow viewers to see the back of the mission model, including a garden or cemetery. I only have vague memories of the original Bayard de Volo dioramas and how they looked, but I thought the new cases looked attractive and highlighted the models well. WW: Have the missions returned to the part of the Farm where they once were? 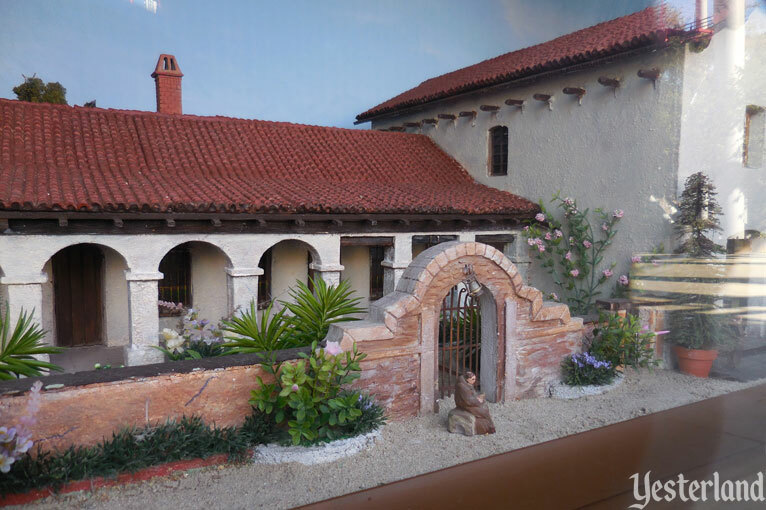 MHH: The original mission dioramas were pretty much in a straight line, along the path of the stagecoach ride. In their current configuration, the missions are spaced—a little unevenly—along the stagecoach path between the underpass and Fiesta Village, but also along the pathway that leads past the Silver Bullet ride entrance alongside the lake toward Camp Snoopy, and the pathway on the other side of the lake by the Merry-Go-Round. 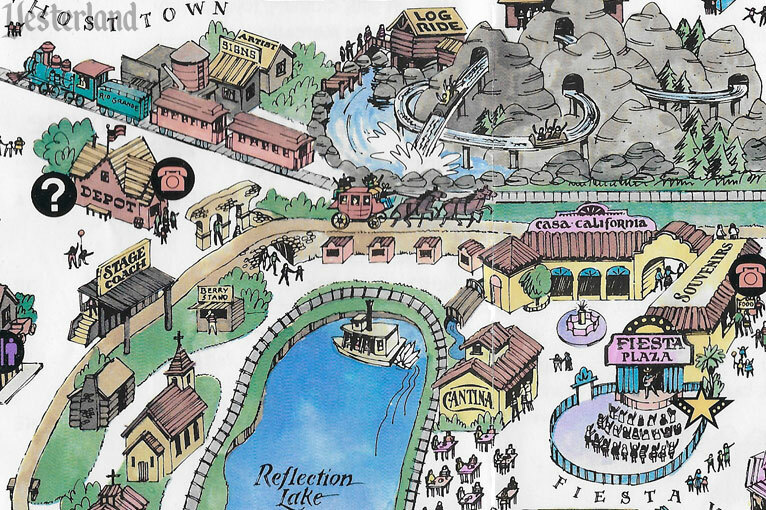 WW: The area between Ghost Town and Fiesta Village used to be a calm and quiet area, with Reflection Lake and the Church of Reflections. Now it’s home to Silver Bullet and other thrill rides. How does that work? MHH: These days, the lake seems to exist more as a backdrop for the Silver Bullet roller coaster, and, walking around the lake, one can certainly hear riders screaming on the coaster, but the roller coaster for Silver Bullet itself is actually pretty quiet. In the area closer to Fiesta Village where several of the missions are located, however, the Jaguar roller coaster is definitely loud right overhead as it travels back and forth over the pathway. WW: Every display case has the name of the mission above the glass, but are there interpretive labels? MHH: Except for the names of the missions, there was not any signage on the display cases or nearby. The signs tell visitors about the names of the missions, but not any information like locations, when they were founded, etc. For missions like San Diego and Santa Barbara, it’s obvious where they are located, but not for missions like Santa Inés, which is next to the Danish village Solvang, or La Purísima Concepción near Lompoc. During his restoration work, Bob Weir always had a detailed book about the California Missions available in front of his work area for visitors to look at. WW: I remember information inside the cases, behind the glass, when I was a kid. 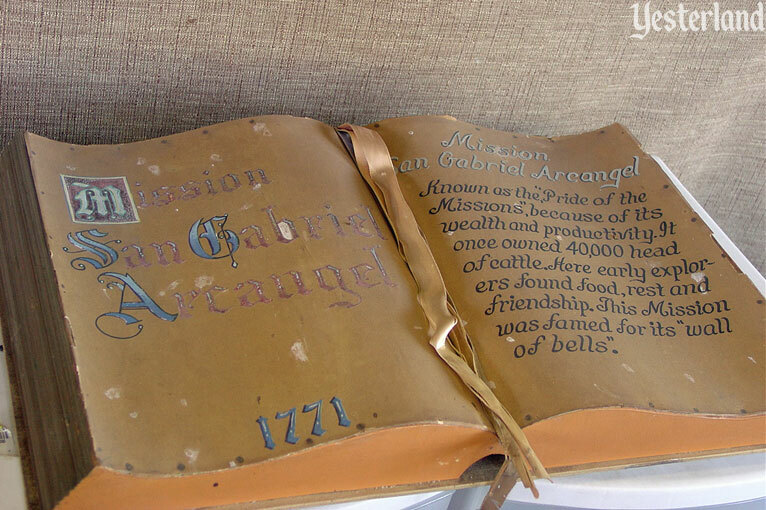 MHH: The original Bayard de Volo models had signs resembling old Bibles with a short paragraph describing each California Mission, including the year it was founded and some interesting facts. Bob Weir had the sign for Mission San Gabriel on display when he was restoring that model in August 2013. WW: Back when I was in elementary school in California many decades ago, lessons about state history painted the missions in a positive light, with not even a hint of a negative side. That has changed. The practices of the Spanish Padres who founded the California Missions have become controversial. Earlier this year, I visited the “Becoming Los Angeles” exhibit at the Los Angeles County Museum of Natural History, which includes the darker side of the missions. Does Knott’s offer interpretative text about the mission system and its consequences, good and bad? MHH: No, nothing of that sort, at least not at the moment. Which is too bad, because when Bob Weir was working on restoring the models, he was a great source of information for visitors about not just his craftsmanship, but the history of the missions and the work of people like Junipero Serra. You could ask him anything about the missions, and I never heard him sugarcoat the negative aspects of the mission system. WW: There may be disagreement about their role in history, but there’s widespread agreement that the California Missions were beautiful structures and have had a profound influence on California history and architecture. I am very pleased that Knott’s has invested in the restoration and reinstallation of the dioramas. I look forward to seeing them the next time I’m in Southern California. MHH: Yes, as much as I enjoyed watching Bob Weir’s progress in restoring the old models and building the new ones, I think the goal was to make them available for park visitors to see on a regular basis, as they had been for many years. 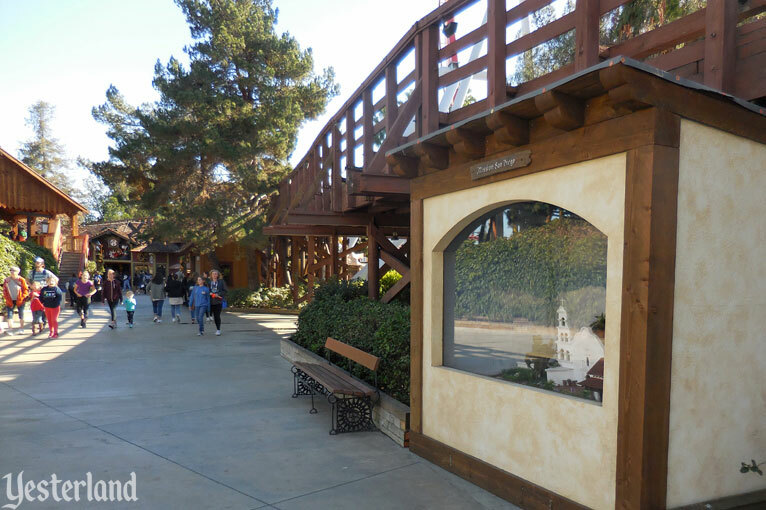 It’s one of the things that makes Knott’s different from most other theme parks, the educational aspect of things like the mission models or their Independence Hall replica across Beach Boulevard. Thank you to M.H. Habata! This article ends with a list of the 21 California Missions, listed from south to north. The bolded names are the first 13 on display at Knott’s. The gray ones have been restored, but are not yet on display (as of the publication date of this article). Thank you to M.H. Habata for his photos of the new mission dioramas and his observations. 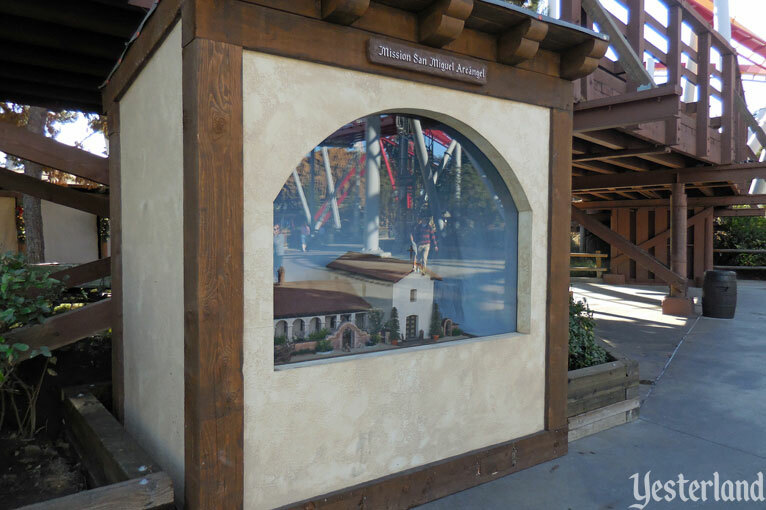 Thank you to Chris Jepsen for his insight on the removal of the original mission dioramas.